The All India Convention of Young Doctors, AICYD 2013 held at Hotel Savera and jointly organized by the IMA-College of General Practitioners and Indian Medical Students' Associtaion has turned out to be a milestone event in the history of Indian medical fraternity. This is the first event to act as a bridge between the veterans and the young blood in the field of meedicine in India. The one-day event saw participations from 156 medical colleges of the country with a total of 500+ students participants. The event had varied programs which included sessions on Medical Entrepreneurship, Legal Medicine, Quiz Competition and student presentations. But, the highlight of the day was the much awaited session by NBE Executive Director, Dr. Bipin Batra. He started by appreciating the effort of uniting the medical fraternity and creating a common platform with seniors and juniors of the profession. Dr. Batra then informed the audience about the various issues which pertain to the future of medical students of the country. Following his lecture Dr.Batra was bombarded with questions by the students present there, he was also asked the questions that were submitted by hundreds of students from around the country. Exit Test for Medical Students: On this issue Dr.Batra informed that in a recently concluded conclave of MCI and other stake holders, most of the members were not in support of the idea and hence, the concept of Exit examinations shall not move forward. Next All India or NEET for PG Admissions in 2014: When asked about the upcoming examinations, he said that "I'm not in a position to announce anything, but, if the Govt. asks NBE is prepared to conduct the examinations". He added that since, the SC ruled out NEET MoHFW has applied to the SC to permit the conduct of AIPG-2014 and the response from SC is expected in the last week of October after which the PG notifications shall be announced. There was however indications that likely dates for the examination are in the second week of December,2013. Duration of Examination: When asked about the duration of examinations that if this time also, the exam would stretch over a period of 10 days, Dr.Batra indicated that if NBE conducts exams then this time the testing window shall be 5-6 days. He also added that taking the exam on a single day is not a possibility owing to the lack of infrastructure to accommodate 90000+ candidates on a single day. Scoring System: When asked about the scoring system, he re-emphasized that this is the best scoring method used worldwide and it ensures complete transparency and chance of good score by luck is impossible. According to him to better understand the system one can read the articles available on Wikipedia on IRT (Item Response Theory). Repeats of slots of Questions in previous NEET: Addressing one of the common queries posted by students, Dr. Batra ensured that this shall not be repeated. 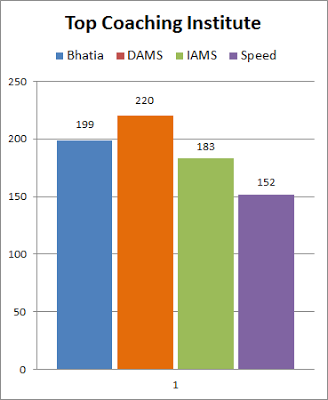 AIPG by AIIMS v/s NEET: The data shared by Dr.Batra showed that in the AIPG examinations conducted by AIIMS previously only 1/3 rd of the candidates qualified whereas in last year's NEET, nearly 70% of the candidates qualified indicating that if NEET be adopted it would justify its role as an eligibility test. Increase in PG seats: Dr. Batra in his speech as well as later announced that NBE has formulated ways to double the DNB seats in coming 3 years. And even MCI is working on the same lines. New PG disciplines: He also announced that starting this year DNB shall be started in 3 new disciplines which are Emergency Medicine, Medical Genetics and Pediatric-Gastroenterology.